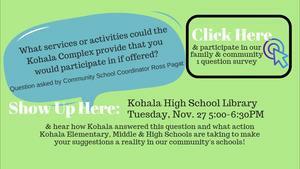 What services or activities could the Kohala Complex provide that you would participate in if offered? Parents of Middle School Students- please take one minute to help our Peer Mediation Students with their parent survey for their project on "Public Display of Affection at Kohala Middle School"
Survey responses will be collected by students on November 26 for their presentation that week. Thank You! 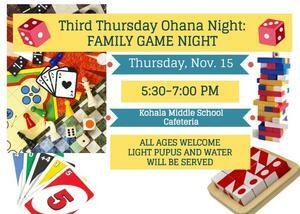 Check out this month's special Thanksgiving edition of our Ohana Newsletter! For the complete copy keep an eye out for a yellow newsletter in the mail. Included inside: important event dates, recipes, kindness projects and announcements! Click here for a sneak peek!